You’ll also earn 500 Lufthansa Miles & More Award miles on your first booking + 2 miles per euro spent. HotelTonight: Use promo code ‘BLAPERS’ for €20 discount on your first booking. VeryLastRoom: Use promo code ‘$LAPERS’ for €15 discount on your first booking. 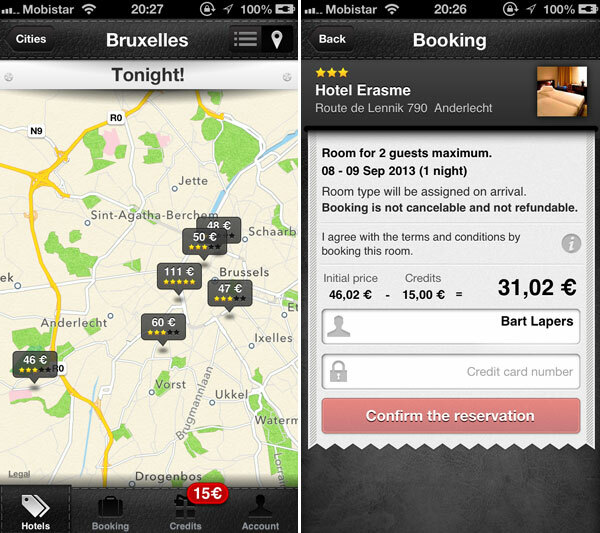 The Justbook app offers discounted rates for hotels in +100 European cities which can be booked up to 7 days in advance. The real deals are last minute, posted on the day of arrival at 10am. Justbook is a Lufthansa Miles & More partner. You’ll earn 2 award miles per euro spent. There’s currently a promo which offers you an additional 500 award miles on your first booking. You should always compare the last-minute app rates with hotel rate aggregators like HotelsCombined.com, Trivago.com, Kayak.com/hotels etc… I noticed JustBook offered some great discounts: e.g Crowne Plaza Brussels Le Palace had lowest rate of €122 on Hotelscombined and Trivago but was offered for €87 via JustBook. What makes JustBook even more attractive is the €20 discount voucher you get by entering ‘N24’ on the Vouchers tab of the JustBook application. Result: €67 for a last minute stay at Crowne Plaza Brussels instead of €122, a saving of 45%! First of all, HotelTonight is a real cool company: check this video of their headquarters in San Francisco. Apart from having an awesome office, they also build a really cool last minute hotel booking app. They initially started with offering hotel rooms in the US only, but now the app also includes Europe and further expansion can be expected as they just more than doubled their capital in Series D funding. The app really focuses on last minute hotel bookings, but you can extend your stays up to 5 nights depending on the property. Deals are posted daily at noon (12pm hotel time) and selection in limited to max 10 hotels per city. 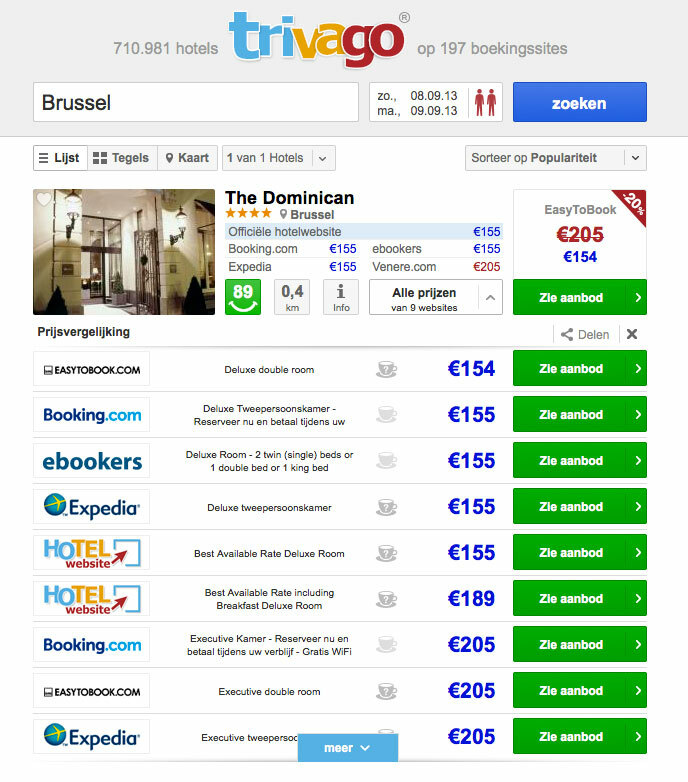 My test case ‘The Dominican Brussels’ was bookable at €154 via Trivago and at €153 via HotelsCombined while HotelTonight offered it for €121. First time users of the app can use a friend referral code e.g. ‘BLAPERS’ to get an additional discount of €20 on their first booking. So in this case the paid rate via HotelTonight would have been €101 vs best available rate of €153, a saving of 44%! Use promo code ‘BLAPERS’ for €20 discount on your first HotelTonight booking! VeryLastRoom, a much smaller player in the last minute booking apps field, offers discounted rooms in France, Spain, Belgium and Luxembourg. The unique aspect of VeryLastRoom? Rooms get cheaper the longer you wait. Prices fall in real time from noon until 2am! 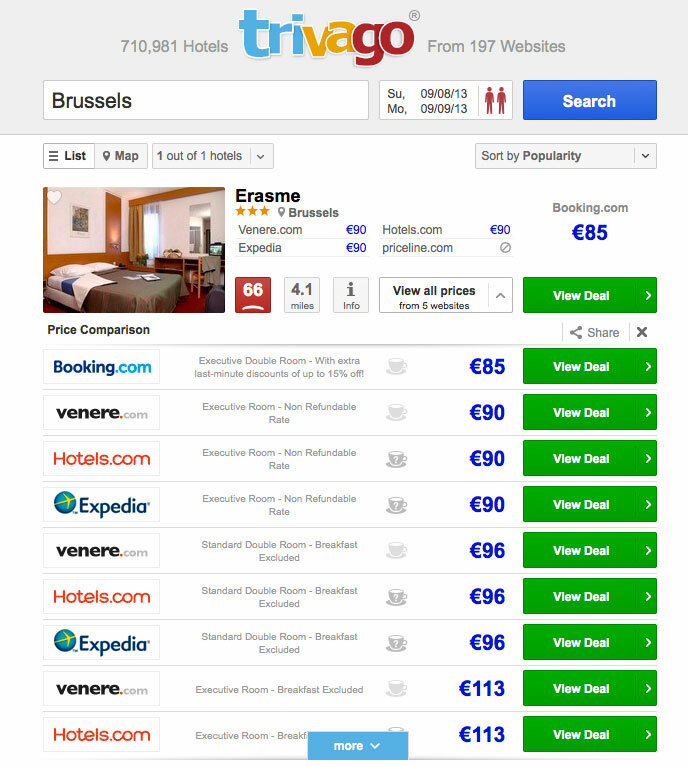 My test case ‘Hotel Erasme’ was bookable at €85 via Trivago and at €95 via HotelsCombined while VeryLastRoom offered it for €46. First time user of the app can use a friend referral code e.g. ‘$LAPERS’ to get an additional discount of €15 on their first booking. So in this case the paid rate via VeryLastRoom would have been €31 vs best available rate of €85, a saving of 64%! Use promo code ‘$LAPERS’ for €15 discount on your first VeryLastRoom booking! Full disclosure: If you use voucher codes ‘BLAPERS’ at HotelTonight or ‘$LAPERS’ at VeryLastRoom I will receive referral credits. Thank you for your support! Is it something we can use for the IHG Best Rate Guarantee ? Crowne Plaza Brussels 87€ instead of 122€ on their website. Do you think it could work ? Hi Romuald, unfortunately these rates are not illegible for Best Rate Guarantee claims as they require a ‘membership’ of the app/site to be accessible. I suppose you dont get points from the hotel chain when you book through JustBook? Correct. But you can still try and show your loyalty card to enjoy elite perks. Can you pay for the justbook with american express? I can only see visa and mastercard in the app. Thank you for your review and codes! I want to know what I have to show to the hotel after a reservation in VeryLastRoom. By the way, I just call to a hotel in Madrid, and it’s not necessary to pay for a tourist tax cause there isn’t.